860 WASHINGTON STREET - Projects - James Carpenter Design Associates Inc.
860 Washington Street is designed to embed the presence of daylight both within the mixed-use building and the public realm surrounding it. Nestled on a prominent corner within the Meatpacking District between the newly completed Standard Hotel and The High Line Building, the highly responsive envelope and timeless quality of the building articulates the 19th century street grid where it meets with the 18th century grid of the West Village and mediates the neighborhood's transformation into a vibrant public realm. 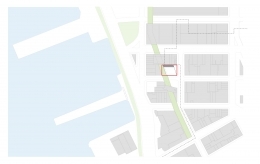 JCDA designed a new mixed-use office and retail space adjacent to the High Line in Manhattan’s historic Meatpacking District. 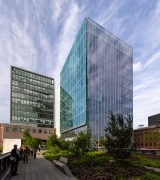 Designed to maximize the experience of natural light in a crowded urban environment, the building provides a luminescent transition point between the High Line and the nearby Standard Hotel. The building’s structural features respond to the industrial character of the Meatpacking District, while adding a contemporary aesthetic drawn from the minimalist material palette of glass, concrete, and finely detailed steel. The eastern face of 860 Washington will utilize floor-to-ceiling glass panels to redirect light down to the street below and allow uninterrupted visual access to the High Line at all levels. This façade is counterpointed by a pane of glass suspended away from the building’s massing connecting it visually with the surrounding architecture. Ambient lighting on the sidewalk creates a textured visual experience for pedestrians and further enhances the building’s connection with its urban landscape. The interior of the building is designed to be infused with natural light throughout, minimizing the need for artificial illumination and supporting an anticipated LEED Silver certification. Utilizing raised floors for mechanical and electrical services, the structure consists primarily open-plan loft spaces. 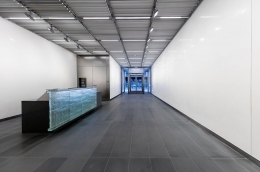 Retail floors are enclosed with clear, low-iron glass that pushes the limits of fabrication, emphasizing and enforcing the connection to the sidewalk and streets.